Even if you're in a seaside promenade or a town in the lakes, where every single house with more than two bedrooms is a bed and breakfast or hotel, then you're likely to want to market your B & B to a particular sector. This can be a tricky game, because if you pick the wrong sector, or one's that's too small, then you can shoot yourself in the foot. If you pick the right one though, specialising can make marketing and advertising easier. If you're in a tourist hotspot, then looking for a niche could be a good way of marking yourself out from the crowd. Towns in the Lake District are a case in point: They are often full to the brim on bank holiday weekends but at other times, marketing your establishment as something different, perhaps being child-friendly or animal friendly, will put you in a niche which might increase your occupancy days out of high season. Other niches are specialising in looking after enthusiasts of a particular sport or pastime, water sports if you're on the coast, or mountain biking if you're inland and near some good spots. Bird-watching or other nature based pastimes might attract people who are a bit quieter, if you don’t fancy the place being over-run with extreme sports fans. Keep an eye out for developments such as the reintroduction of rare birds or animals, as they might give you a hook into a niche market. 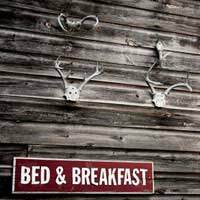 If you're the only B & B in a particular area, then that effectively has to be your specialisation, the location. Get involved in everything that's run by local authorities and tourist boards and make sure that everyone knows you're there and what you offer. If there's a natural attraction in the area then market yourself in magazines and on websites that cover that sort of attraction, although if you're the only B & B in that location then there's probably not much tourist trade anyway. B & B's can do well in urban areas too though, as a lot of small businesses don't like paying for full-on hotels, preferring a quiet, homely atmosphere. To tap into this market you need to approach local businesses so that they can pass your details on to travellers who visit them. Local advertising will help too, as people having weddings or other family functions will often need space to put friends and family up. Lifestyle niche marketing may help to set you above the crowd too. If you're able to claim an eco-friendly or carbon-neutral B &B then the growing awareness of these issues could make you more attractive to visitors. Offering a completely organic menu will give you access to another niche market that's getting bigger every day. There are other narrower niches in the food area such as vegetarian, dairy-free, vegan and others. Be careful here though, if you narrow the market too much you might start restricting the numbers of people you can attract to your B & B, which is not good for business. It's likely that you will have to experiment with niches, some will work better than others. Some may be too narrow and others attract the wrong sort of guests. It's a delicate balancing act which needs time, research and care.